﻿ Hyundai Grand i10 5DR | HYUNDAI - NEW THINKING. NEW POSSIBILITIES. 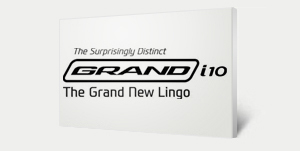 The Grand New LingoARTNOVATION - The Hyundai Grand i10 5DR brings to you a whole new level of ART + INNOVATION. So much so, that it makes much more than a mere statement. Premium and spaciousThe feature-packed Hyundai Grand i10 5DR responds to your every expectation. 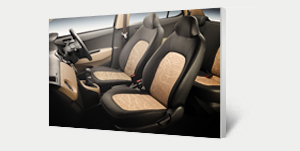 The cabin color, textures and shape lend it a premium and spacious appeal that will easily make any large car envious. 1.1 CRDi diesel engineThe most advanced and affordable 2nd generation CRDi technology ensures more performance, more efficiency with lower running costs, lower NVH and lesser emissions. The world is changing every day. So we decided to also change the way people communicate with each other. 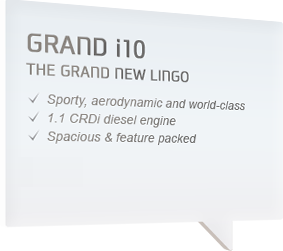 Introducing the Hyundai Grand i10 5DR-the Grand New Lingo. The car that lets you share a new language with the world. Go on out there and spread the Grand new Lingo. Headlamps The neatly housed swept back headlamps and rear combination lamps assembly amplify the overall profile. Chrome-coated radiator grille Positioned to perfection, the chrome radiator grille complements the looks and projects strong presence. The Hyundai Grand i10 5DR takes sharp styling to a whole new level. Each and every part of the exterior has been crafted to perfection and leaves an everlasting impression on all those who catch the glimpse of it. Outside mirror repeaters Aerodynamically sculpted outside mirror is ornamented with LED repeaters for enhanced looks and safety. Roof rails The stylish black integrated roof rail lends a sporty appeal to the car while completing modern exterior character. Chrome-coated outside handles Chrome coated door handle lends a premium look to the overall profile of the car and easy to operate. A marriage between breathtakingly design and future skewed engineering. The ability of the Grand i10 5DR to turn heads wherever it goes. Rear combination lamps Clear rear combination lamps increase the style quotient and ensure high visibility for added safety. Rear spoiler The neatly integrated rear spoiler is provided for better aerodynamics and rear profile aesthetics. Chic, distinctive looking side molding imparts sporty looks and prevents side scratches to body. Uniquely designed black and chrome diamond cut 14� alloy wheel imparts a sporty and dynamic appeal. The sleek and sporty micro roof antenna enhances looks and provides seamless connectivity. The large rear bumper reflectors enable proper visibility to trailing vehicles and ensures safety. The Grand i10 5DR proves the point that a comfortable and spacious car doesn�t have to be cumbersome. The feature-packed Hyundai Grand i10 5DR responds to your every expectation. The cabin color, textures and shape lend it a sport appeal that will easily make any large car envious. Front and rear seat Ergonomically designed bucket type front seats and spacious & cushioned rear seats with adjustable headrests offer ample support and comfortable seating. Trunk space Ample trunk space to accommodate your weekend luggage, bench folding function provides you an extra flat load space. Rear air ventilation1st-in-segment rear air ventilation has been designed specially to enhance rear passenger comfort with instant cooling. Audio system (radio, CD, MP3) Radio+CD+MP3 audio offers endless music experience and is equipped with Bluetooth. Considering the hot climate of India, floor console offers 2 cup holders big enough for 1 liter bottles. This feature activates with the opening of tailgate and enables proper lighting in trunk area to help locate/put objects in dark. 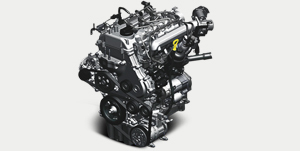 For our value-conscious customers, we offer the most advanced and affordable 1.1 U2 diesel engine. The 2nd generation CRDi technology offers improved operating pressure, low compression ratio, light weight engine block and an enhanced atomization of fuel which altogether ensures more performance, more efficiency with lower running costs, lower NVH and lesser emissions. The 16V DOHC Kappa engine with dual Variable timing valve train (VTVT) technology provides you the best of both worlds - superior mileage and optimum performance. The VTVT system controls the valve operation depending upon the engine requirement leading to better efficiency with lower emissions. Automatic transmissionDriving in traffic is a breeze with 4-speed automatic transmission. Offered with 1.2 Kappa petrol variants of Grand i10 5DR for a delightful driving experience in congested city traffic. 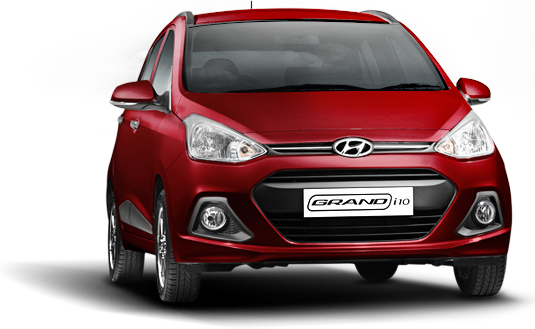 Manual transmissionBoth petrol and diesel variants of Grand i10 5DR offer light weight and robust 5-speed manual transmission for smooth and accurate gearshifts. Thus delivering optimum performance. Aerodynamic design Aerodynamic designed bumper reduces forward air flow resistance and rear spoiler effect for improved fuel economy and driving stability. Gear shift indicator The innovative digital gear shift reminder recommends optimum gear so as to extract maximum mileage. World-class safety has always been Hyundai�s strongest offering in all the cars. The Grand i10 5DR just takes that commitment forward in a Grand new way. The driver and passenger dual airbags ensures additional protection to occupants in the event of frontal impact. Structural safety The Structural Safety of GRAND i10 got special attention by use of anti corrosive steel, ring structure application to enhance the rigidity and body robustness. Anti-lock brake system (ABS) The Anti-lock brake system (ABS) prevents skidding and retains car’s steer ability on slippery surfaces. Rear parking assist system (RPAS) Useful for parking in tight spaces, the parking assist detects obstructions while reversing with the help of a proximity sensing buzzer and minimizes the risk of a possible collision. The inside rear view mirror comes equipped with day/night modes to reduce trailing vehicle glare while driving. The ergonomically located switches on door armrest aid in easy operation of windows conveniently and comfortably. The supervision instrument cluster is aesthetically designed for the maximum visibility. Easy-to-read dials, along with the eye-soothing blue & white illumination gives the interior of Grand i10 5DR additional nice touch. without having to take your hands off from the steering wheel. Audio remote controlThe drivers can control the audio system from a switch on the left-hand spoke. Bluetooth hands-freeHands free phone calls stream music wirelessly. Air conditioning system The aesthetically designed and easy to reach dials of air recirculation system control the cabin environment effectively. Useful for placing small utility items and also acts as a hiding cover for luggage or items stored in the trunk. Enables remote locking/unlocking of doors and tailgate, thus ensuring protection against unauthorized entry into the vehicle. Electrically adjustable and foldable outside mirror offers great combination of comfort and convenience. The ergonomically located switches on door armrest aid in easy operation of windows and door locking conveniently and comfortably. Aesthetically designed map pocket is useful for keeping essential papers and offer build in bottle holder. Ideal for storing small utility items and gadgets like iPod or mobile phone while charging or playing. iPod is a trademark of Apple Inc.